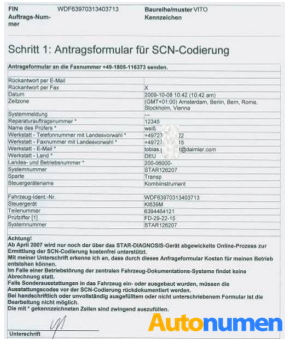 Mercedes Benz SCN Coding must be performed if the Sprinter PSM (Parameterizable special module) had not been installed. 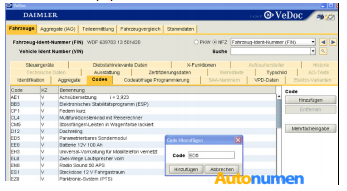 SCN coding should be applied together with MB Star Diagnostic Tools system. PSM Coding can be achieved via both online and offline, here is the instruction of offline coding. Our Offline SCN Coding service is valid for MB STAR diagnostic software HDD 2013. * to 2014.7 version. After download the software, provide your ID to us, we will calculate the key for you. If an e-mail address is indicated on the fax form, SCN coding will be sent via e-mail. If a fax number is indicated on the fax form, SCN coding data will be sent via fax. 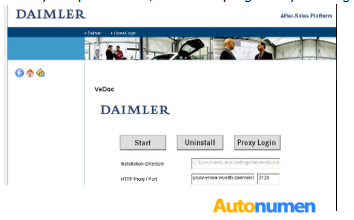 Before sending the fax form to the Star Diagnosis Help Desk, the appropriate control unit must be added in VeDoc to the vehicle equipment list. Print out and send the fax form to the indicated Star Diagnosis Help Desk fax number. In the MB STAR DAS (Diagnosis Assistance System), select the menu item “Step 2: perform SCN coding”. Continue with “F3”. Benz Diagnostic Tools, MB Star, MB Star Diagnosis, MB Star Diagnostic Tools, Mercedes Star Diagnostic, Mercedes Star Diagnostic Tools. Bookmark.